WASHINGTON (AP) — Leaders are speaking far more simply and with more confidence than they did four score and seven years ago. Donald Trump's speech has accelerated that trend. 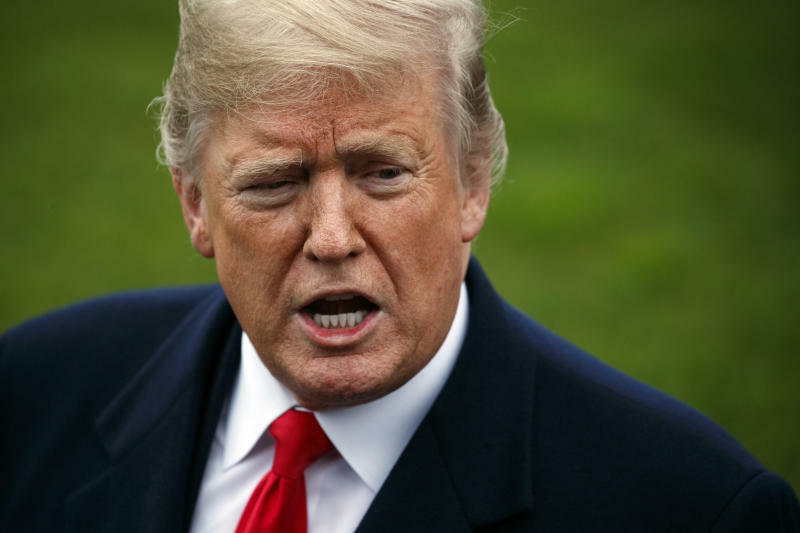 Trump's speeches, debates and documents scored the highest among presidents on a scale that tries to measure confidence in language, more than twice that of low man William Henry Harrison. 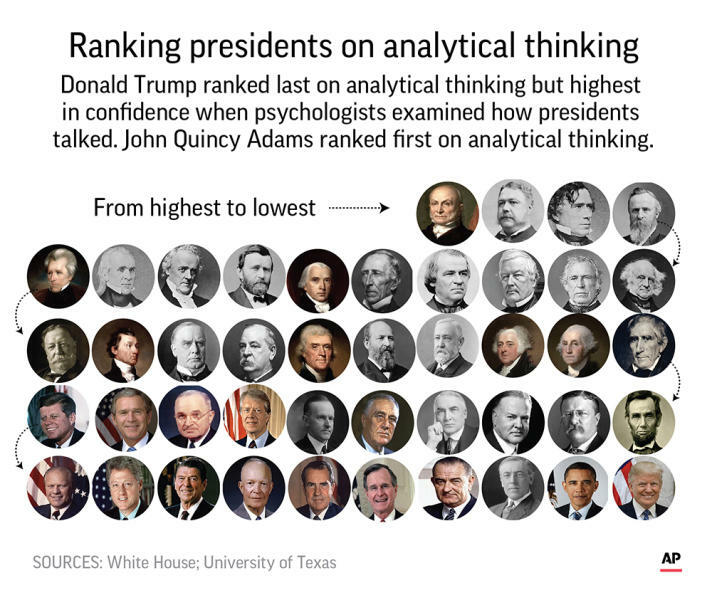 He ranks last in speaking analytically, scoring less than half of leader John Quincy Adams and substantially below recent presidents such as George W. Bush and Barack Obama. Kayla Jordan, a psychology researcher at the University of Texas and lead author of the study, said the nature of leaders' communication began to change around the time of Woodrow Wilson, when radio and then other mass media began to emerge and when the voting population expanded to women, minorities and young people. There's nothing wrong with being simple, she said: "You want everyone to understand what you're saying." Jordan said the team looked at how leaders spoke, not at what they said. The study looked at all sorts of utterances — but not tweets — including presidential debates in part to try to minimize the effects of professional speechwriters and get more "off the cuff" speech, Jordan said. They examined articles and prepositions — such as "the" and "of" as signs of more analytical thinking, because often those words signal a phrase that explains things. Personal pronouns and adjectives — "I'' and "beautiful" — are rated less analytical. Words like "we" and "you," are rated more confident, while tentative and negative words, like "not," ''would" or "should," are rated as less confident, Jordan said. A computerized system developed by one of the study's authors called Linguistic Inquiry Word Count spits out a score for analytics and complexity. "We understand that Trump is very different in a lot of other metrics. We're focused on these two and in these two he's not outside of the norm," Jordan said. "This isn't capturing his intelligence or other traits." Before Wilson, a former president of Princeton, the average presidential analytical score was 97.7. Since then it's has been 79.5. Obama's 69 was almost 13 points below George W. Bush. When it comes to speaking with confidence, or what the researchers also call clout, Trump tops all the presidents with an 89 rating, far above the average of 64. Only four presidents averaged more than 80 on clout and they are all relatively recent: Trump's 89, Lyndon Johnson and Obama's 81 and George W. Bush's 80. "The more simple a message is, the easier it is to be clear and certain about it. Complex messages don't lend themselves to high levels of certainty," said Pennsylvania State University communications professor Mary Stuckey, who wsasn't part of the study. "So as messages simplify certainty will go up." Stuckey, who is editor of the Quarterly Journal of Speech, said the study was consistent with other, similar research, but that style of speech is only one component of political language. "It does a good job of measuring what it does," she said. Jennifer Mercieca, a professor of political rhetoric at Texas A&M University who wasn't part of the study was skeptical of the way that system scored. She doesn't think the study's system takes into account seemingly contradictory and even ironic statements Trump makes.